Each August, a blizzard of white covers many fields and roadsides as Queen Anne’s Lace opens its flowers, and offers its annual mystery. Look at the cluster of hundreds of tiny white florets. Right around the middle, you’re apt to spot one little purple flower. Why is there a single, colored floret in a sea of white? No one knows for sure, except the folklorist. Long ago, the story was told to children that Queen Anne pricked her finger as she was stitching some lace, and the purple flower is her bloodstain passed down the centuries. Less mysterious is the plant’s ties with man. Pull one up and smell the root. Its scent is a clear give-away. Called by the scientist Daucus carota, Queen Anne’s Lace is an ancestor of our garden carrot. 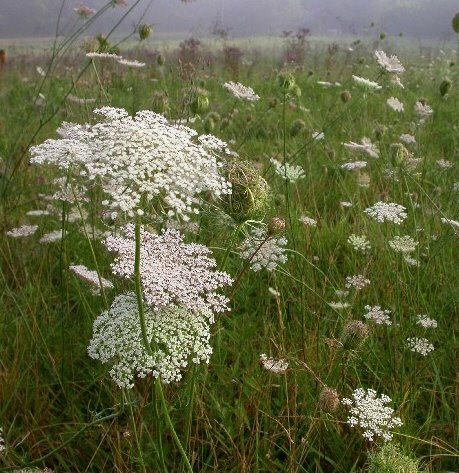 In its native England, where the wounded Queen Anne lived, it is known simply as Wild Carrot.